Dazed Digital: How did you first get into photography and how long have you been taking pictures for? Columbine Goldsmith: My father is a cinematographer and gave me a camera when I was quite young. I took my first roll of film in Mexico in 1986 (I was five) and actually they remain my favorite photos to this day: Shots of water reflections, dripping bathing suits, and asking my babysitter to pose with various dolls around the bedroom. DD: Why do you take photographs? Columbine Goldsmith: Every once in a while you see something you want to save, and for me, photographs are the quickest was of doing that. DD: How would you describe your photos to someone who hadn’t seen them before? Columbine Goldsmith: Oh. Hmm. I am not sure how to answer that. They are a little too pretty sometimes, which I hate, but I guess at best I would say they are kinda romantic and hopefully a bit weird at exactly the same time. DD: Is storytelling important through your images? Columbine Goldsmith: Yes, I am always drawn to a narrative. Growing up in Los Angeles, surrounded by the film business, I think storytelling got drilled into my brain. DD: You shoot on a variety of cameras and films what do you feel each offers? Columbine Goldsmith: I will shoot with whichever camera is around me. But I think Polaroid is the best because of how bizarre and enjoyable it is. 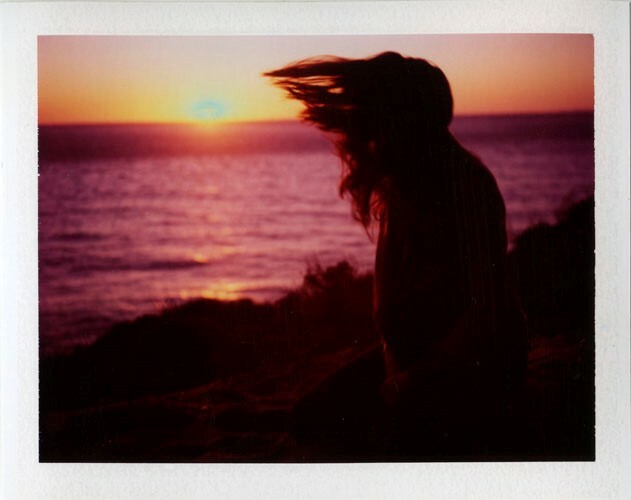 You've had a moment, and then – click – it's in your hand, and even if the Polaroid gets sand all over it or blows away, it's an incredibly satisfying experience. DD: Are you influenced or inspired by any other photographers or artists? Columbine Goldsmith: Artists and filmmakers – yes. I have many artist obsessions but no photography ones. I am actually not super moved by most photography (including my own). I much prefer to see a Marina Abramovic performance or go to a Herzog film than a photography show. Although maybe Mapplethorpe, for his simplicity. DD: How and why did you start photographing Coco Young to Janell and Will Berman? Columbine Goldsmith: They are friends, and so it just seemed natural. Coco was introduced to me through a friend of my sister's, and we and some other friends went up to my house in Woodstock for the weekend. It was a chilly, white winter day and we took two rolls of film of her standing on the bed, and then we spent the rest of the weekend roasting chickens and making fires. Janell and Will live below me in Brooklyn, and since I went to school with Will I have known him for ten years, I guess. Janell is also just a very, close friend, and since they had not been seriously photographed as a "couple" it became a lovely project. They are protective, and understandably so, about their private life, but this all felt very natural. DD: These images are beautiful and have a real intimacy to them – how awkward was sharing their private moments? DD: Are there any other particular people or models you enjoy photographing and why? Columbine Goldsmith: My favourite subject is my sister, Alice.